On the Today Show, April 6, 2017, DIY (do it yourself) spring art projects were presented to spruce up the home for spring. One of the art projects involved taking a cut piece of eggplant or an artichoke and dipping into a paint color, and making a block painting on a white paper. The modern art was fabulous, actually worthy of being framed art to hang in one’s home. The segment was clearly geared to adults beautifying their homes. When this Grandma thinks about an art project, it is for grandchildren. I knew that if I just used the internet, I could find great projects using fruits and vegetables that we could do with grandchildren, and have their art to hang in our homes. After all, we hang their scribbles, so why not create actual artistic block prints that will last. Yes, I found many resources and most can be done with a grandchild as young as two or three. 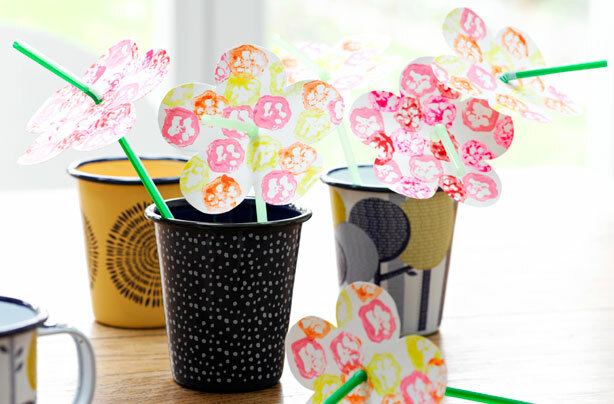 out of the U.K. are beautiful and easy ideas for celery-print flowers, runner bean-print leaves, apple-print butterflies and a pepper-print tree. For older grandchildren, I loved the idea of cutting a potato in half and carving out a design with which to make a block print. See the skull painting and you can imagine the preteen grandchildren swooning. It is great to have the step by step instructions and pictures of the finished products. (2) You Tube is always a great resource. There is a great video on turning apples into lunchtime art, celery into floral masterpieces, and potatoes into anything you can dream of. (3) First Palate has the most organized list and variety of fruits and vegetables that you could imagine to make block prints. They even suggest using fabric as a background and stamping using fruit and vegetables. After all, block painting is stamping of sorts. Watch the You Tube video and then head out to see what fruits and vegetables the children might want to use for their own block painting. You can then continue this activity in the supermarket with expanding their horizons and looking at even more choices of fruits and vegetables they could use. Remember targeted supermarket shopping is a great activity with children. They will want to head for the candy and cookie aisles. You will have to limit them to one treat though, in addition to searching for fruits and vegetables that would work to make art prints. See if they might want to taste some of the vegetables, and the parents will love you. Before you begin the painting part of this activity, remember to use the old towels you have collected and cover all the surfaces on which the grandchildren will paint. You can make smocks by cutting holes into the center of some of these old towels. Just tie some string around the grandchildren’s waist for less mess. I must admit that my grandsons would prefer painting in their underwear and then taking a bath.